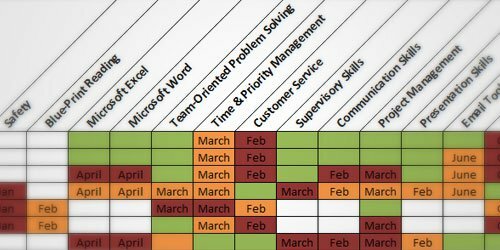 Planning and organizing employee training for an entire year can be a challenge. That's why we're providing you with a simple worksheet to help you chart and organize the types of training classes that will be offered in a given year, the individuals who will attend those classes, their perceived skill level, and the timing of when they will attend training throughout the year. Chart the individuals in your organization under the column "Name" and their corresponding department or position in the second column. List the classes that your organization plans to offer during the upcoming year at the top of the chart. Color code the cells for each individual based on the degree to which each employee needs training in a specific topic area or skill. Within each cell, insert the timing (month or month and day) of when you plan to offer this class or when each employee will attend this class. Insert any relevant comments around the individual. Need quotes for particular training programs? Contact Chris Kutsko at (440)947-1286 or ckutsko@yourerc.com. You can also view ERC's full catalog of employee training courses online.